The State of New Jersey has gone to federal court to block a seismic survey planned for this month fifteen miles offshore. The survey, funded by the National Science Foundation, received its final permits from the National Marine Fisheries Service last week; the permit (similar to those issued routinely for oil and gas exploration or Navy sonar training) allows the sound from the airguns to incidentally harass marine mammals, including the possibility of some permanent injuries. The New Jersey Department of Environmental Protection is aiming to stop the surveys from commencing in the next week or so; they claim that this is a poor time of year to introduce potentially harmful or harassing sounds, that the surveys could disrupt local fisheries for scallop, flounder, and squid, and that the National Science Foundation should have undertaken a more comprehensive public comment and environmental assessment process. UPDATE, 8/14/14: Mechanical issues have sidelined the survey for this summer; the National Science Foundation plans to carry out the survey next year instead, while local activists vow to push for more thorough analysis and public input. 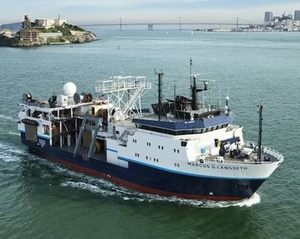 The survey, by Columbia University’s research vessel the Marcus Langseth (left) would examine seafloor sediment, as part of research looking at how climate change has affected river runoff and deposition over the past sixty million years. Some critics, though, seem to be conflating the purpose here with a broader initiative underway to open Atlantic waters for new seismic surveys exploring for oil and gas; those plans have stirred controversy in states up and down the eastern seaboard. “We believe the timing of this program will be detrimental to various marine species that migrate and breed off the New Jersey coast and will negatively impact the commercial fishing industry that relies heavily on these resources,” said New Jersey DEP commissioner Bob Martin. Similarly, Bob Schoelkopf of the Marine Mammal Stranding Center in Brigantine, was quoted as saying: “Right now, bottlenose dolphins are mating and giving birth off the coast of New Jersey. May and June are the birthing periods. They are totally dependent on their parents to provide nursing for the first two to four years of their life, and if the mother, for some reason, cannot catch fish to eat, she can’t produce milk.” It’s not obvious from these statements whether there is another time of year that either would suggest for a survey such as this. Meanwhile, the Asbury Park Press spoke to the project’s lead scientist, Rutgers geology professor Greg Mountain, likens the technology to medical sonograms, and says it will cap years of investigations using sea floor corings to recover ancient sediment. The goal is to understand climate and sea level changes over millions of years, information that will be critical to foreseeing future sea level change along the East Coast, Mountain says.